GM is reviving an old series today, Now and a Long Time Ago. He is doing so because a reader pointed to a fantastic collection of photos from the days when the Capital Crescent Trail was the Georgetown Branch of the B & O Railroad, and freight trains rumbled all the way in to the West Heating Plant. 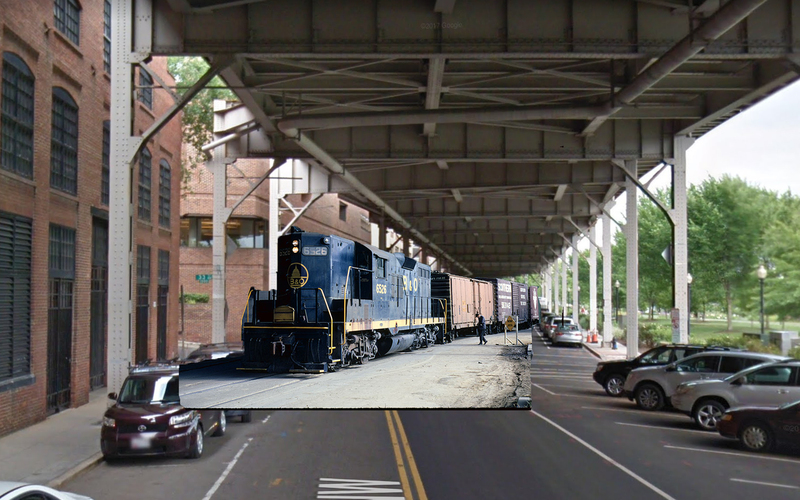 The photo montage GM made, above, is a combination of a photo from 1973 showing one of those freight trains passing 33rd St. and the same scene 45 years later. This was still twelve years before the last train made the run on the tracks in 1985. It’s still remarkable to think about how industrial this stretch was so recently. Just think how Chadwick’s and the old Bayou nightclub were just feet from a working freight line. Does anyone have any stories of how bars serving alcohol and heavy freight don’t mix well?